Sarajevo property market is currently in fast development as Sarajevo grew back to become a stable regional center. The investments in real estate have increased during the past several years and the prices have started to go up dramatically giving the investors a fast profit out of their investment. The market is looking at a growing perspective as Sarajevo enters a phase of intensive reconstruction and a large boom in European businesses showing their presence on the Bosnian market. The most popular place for land and real estate investment recently were the Olympic mountains, Jahorina and Bjelasnica, as intensive construction is taking place in expectation of increased tourist arrivals. There are still many unresolved problems on the property market in Sarajevo: papers tend to be shady and the matter of ownership is frequently doubtful. However with some help you would be able to invest wisely and choose for yourself a nice piece of property in Bosnia. 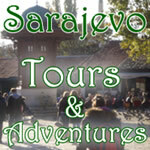 For any additional information about property in Sarajevo feel free to contact us. We would be happy to assist you in finding the right kind of property and mediate your purchase. We provide a complete service to our clients, from locating properties, to completing the sale or purchase, and in addtion, we cover all related paperwork, and can arrange reconstruction, interior design, insurance and property managment, all to suit your specific requirements. If you are looking for a holiday home in Sarajevo, or a commercial property, you can talk to us with confidence.